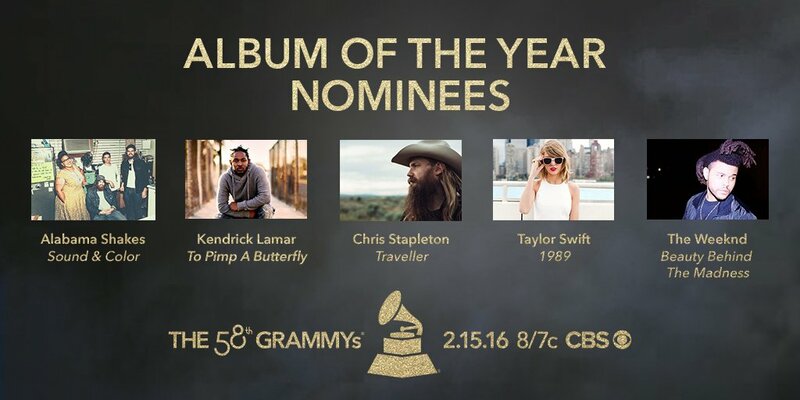 58th GRAMMYs: Who is winning Album of the Year? A Southern rock band teamed with some of the best producers in the industry; a Compton rapper who created one of the most critically-acclaimed albums of the decade; a Nashville songwriter who stunned the country music world with his solo debut; a pop star who had the highest grossing tour in the world this past year; and a Canadian singer who dominated the charts with a soulful voice and drug-induced lyrics. That’s the profile of the five outstanding nominated artists for Album of the Year (AOTY). All bets for Album of the Year are off. And what makes this race unpredictable is how diverse (and yet so similar) the line-up is. This year’s contestants include: One folk/rock album (Beck); two urban crossover acts (Beyoncé/Pharrell); and two male British singers (Sam Smith/Ed Sheeran).